"Indeed Allah chose Isma'il from the progeny of Ibrahim, chose the Banu Kinanah over other tribes from the children of Isma'il; He chose the Banu Quraish over other tribes of Kinanah; He chose Banu Hashim over the other families of the Quraish; and He chose me from Banu Hashim." —Related by Muslim and Tirmidhi. According to Islamic prophetic tradition, Muhammad was descended from Adnan. 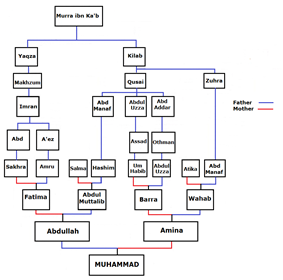 Tradition records the genealogy from Adnan to Muhammad comprises 21 generations. "The following is the list of chiefs who are said to have ruled the Hejaz and to have been the patrilineal ancestors of Muhammad." Various genealogies of Adnan up to Isma'il have been narrated. Adnan was the ancestor of the Adnani Arabs of northern, central and western Arabia and a direct descendant of Isma'il. It is not confirmed how many generation are between them, however Adnan was fairly close to Isma'il. Isma'il had twelve sons who are said to have become twelve tribal chiefs throughout the regions from Havilah to Shur (from Assyria to the border of Egypt). Genealogists differ from which son of Isma'il the main line of descent came, either through his eldest son Nabut, or his second son Qedar who was the father of the North Arabian Qedarite tribe that controlled the region between the Persian Gulf and the Sinai Peninsula. Genealogists also differ in the names on the line of descent. "The genealogists do not differ concerning the descent of our Prophet Muhammad as far as Ma’add b. ‘Adnan." "The descendants of `Imran, mentioned in Allah's saying, ‘Allah did choose Adam and Nuh, the family of Ibrahim, and the family of `Imran above all people,-' [Quran 03:33] are the believers among sons of Ibrahim, `Imran, Yasin and Muhammad"
"And We sent Noah and Abraham, and established in their line Prophethood and Revelation: and some of them were on right guidance. But many of them became rebellious transgressors." —Qur'an, chapter 57 (Al-Hadid), verse 26. It is unclear how many generations are between Ibrahim and Nuh. Nuh's son Sam was the ancestor of the Semitic race. —Related by Hakim al-Nishaburi in Al-Mustadrak alaa al-Sahihain. ^ Hughes, Thomas Patrick (1995) [First published 1885]. A Dictionary of Islam: Being a Cyclopaedia of the Doctrines, Rites, Ceremonies, and Customs, Together With the Technical and Theological Terms, of the Muhammadan Religion. New Delhi: Asian Educational Services. p. 19. ^ Ibn Hisham, Rahmat-ul-lil'alameen, 2/14-17. ^ Firestone et al., 2001, pp. 11-12. This list of names is based on the work of a 16th century Syrian scholar. Alternate transliterations of the Arabic appear in parentheses. For those names that have articles, which use the most common English name, the article has been linked, but the name appears as transliterated from the Arabic.